Boxwood Junction is an inclusive community for people with disabilities. Our mission is to offer residential, employment, recreational, social and therapeutic services for our residents while engaging them in the greater community. 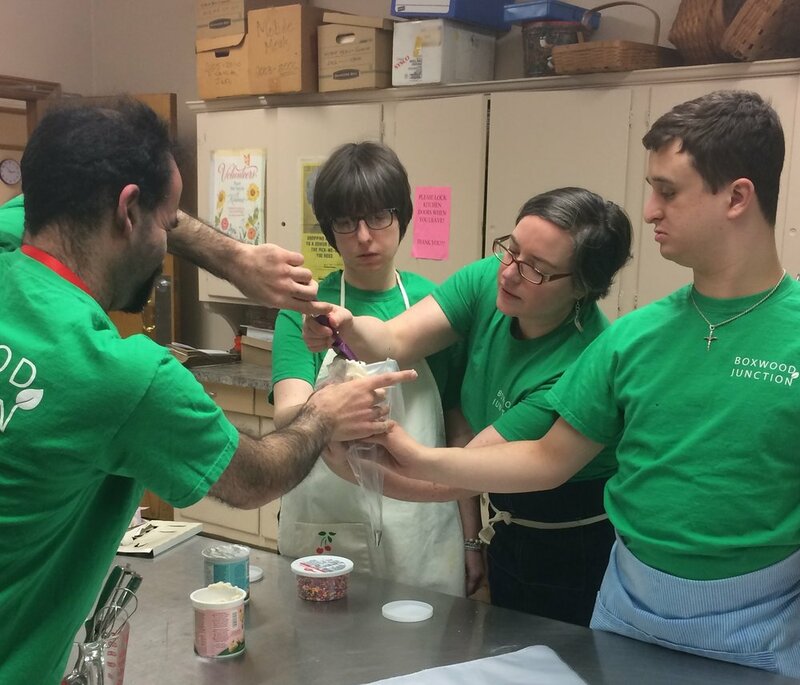 Boxwood Junction team members will work on various projects to increase employment skills. The John M. Migton Foundation was created by a group of families and friends of people with disabilities who want a better future for their loved ones. John, the parent of Barbara Migton, passed away suddenly at the age of 62 on November 9, 2015. His wife, Joan, and daughter, Christine, decided that Barbara would need to be surrounded by a supportive community where she could be supervised and assisted, where she could work and live with friends and families. Other families who shared a similar vision joined in the plan, created the vision, and set the wheels in motion to fashion an innovative residential and employment model to support people with disabilities and to allow them to live with those who have chosen to mentor them in an inclusive community. We just want everyone to belong. The Boxwood Junction Board of Directors. Boxwood Junction seeks to create an inclusive community for people with disabilities to reside with live-in mentors rather than outside staff. We believe that this will create an integrated property which will be more stable than a group home or supported apartment, providing supports to suit individual needs. The model will also be more cost effective and efficient, providing residents with opportunities to socialize in a protected environment. Because our residents will need employment opportunities, our plans include the creation of businesses that will give them those valuable life experiences while supported in an integrated setting. Job tasks will be designed to suit each resident’s needs and abilities, including flexible scheduling and individualized work programs. Meaningful work makes everyone happy! If you know of someone with a disability who would benefit from our services, or if you or someone you know would like to volunteer your services, please contact us. We are looking for people with fundraising, business, legal, real estate, or marketing skills who share our vision. Email us at boxwoodjunction@gmail.com.